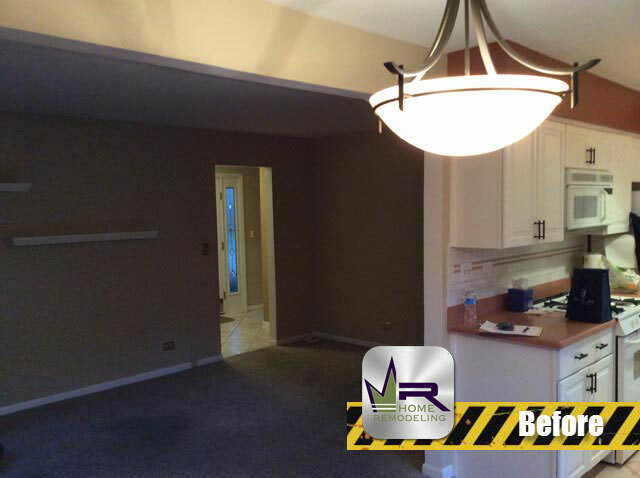 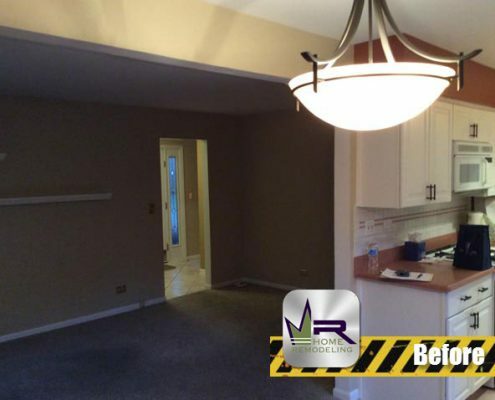 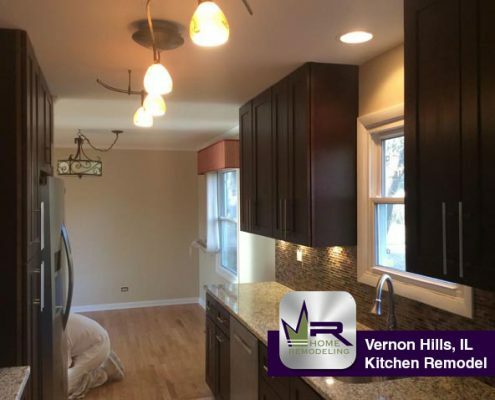 This home can be found in Vernon Hills between the intersections of IL-Route 45 and South Butterfield Road and IL-Route 45 and North Buffalo Grove Road. Vernon Hills is an affluent village in Lake County with a population of roughly 25,000 residents according to the 2010 census report, which was an increase in close to 5,000 residents, or about 25 percent, since 2000. 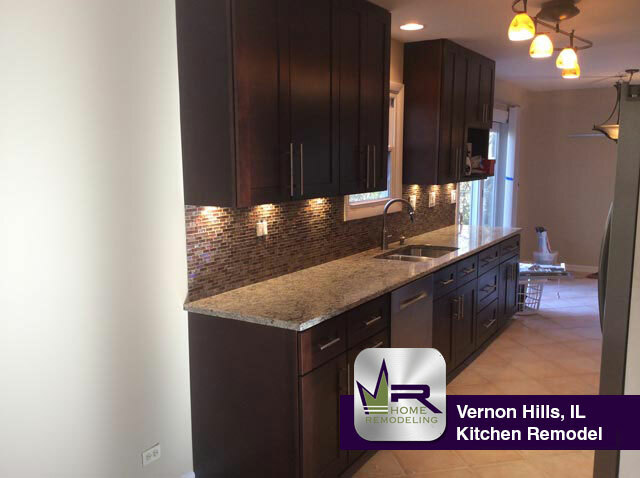 Students living in Vernon Hills will either attend Libertyville High School or Vernon Hills High School. 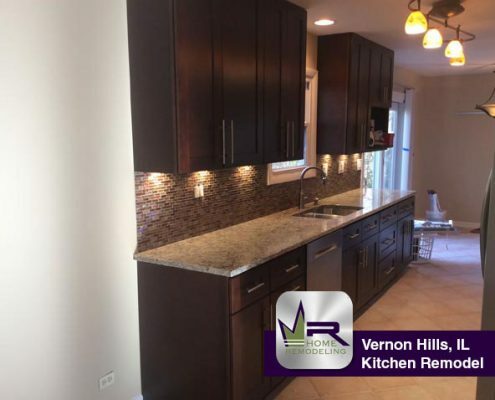 Some of the notable shopping and eating locations in Vernon Hills include: Uncle Julio’s, Dave & Buster’s, Portillo’s, McAlister’s Deli, Home Depot, SEARS, Walmart, and countless others. 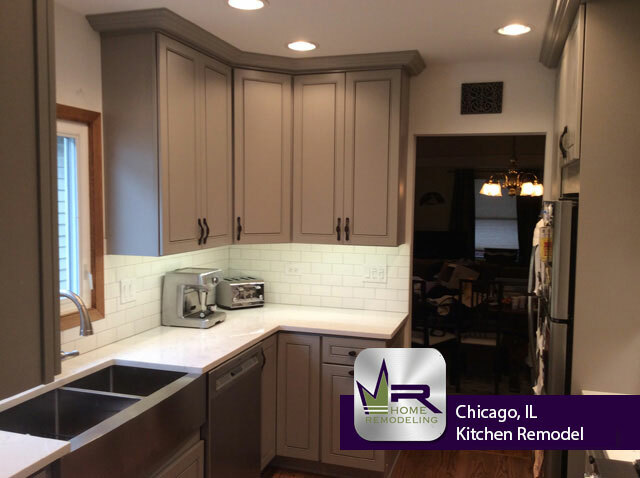 Unlike the bathroom remodel that Regency completed in this home, the residents wanted to make some more dramatic structural changes to their kitchen area in hopes that they would be able to get more practical use out of their kitchen space, create a more open floor plan, and also creating a better area to entertain guests and family. 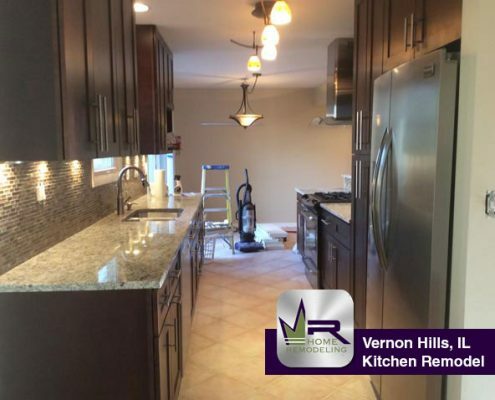 The demolition of the first floor began with removal of all: kitchen appliances, cabinetry, countertops, backsplash tiles, soffits, and a portion of the partition wall that was separating the kitchen area from the dining room. 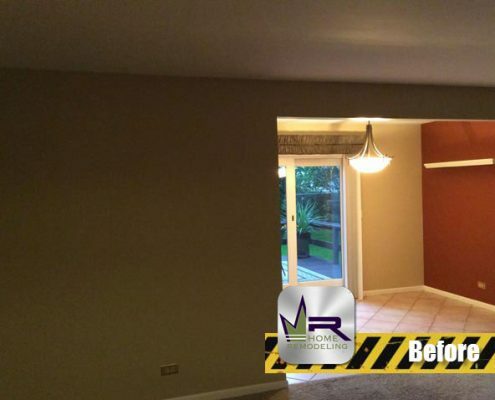 The removal of the partition wall would create a more open floor plan and make the entire first floor appear and feel significantly more spacious. 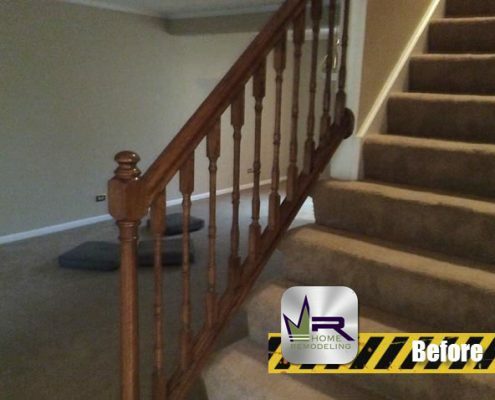 Also, the carpet from the staircase leading to the second floor of the house was removed. 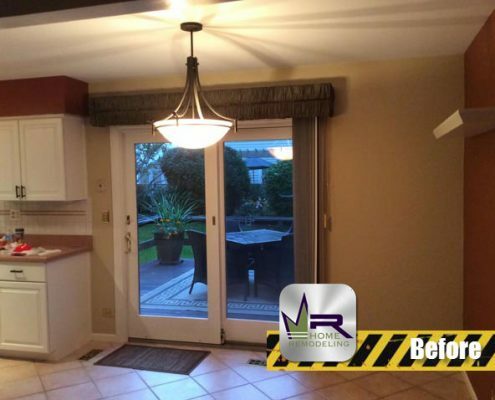 What an amazing kitchen and dining room area! 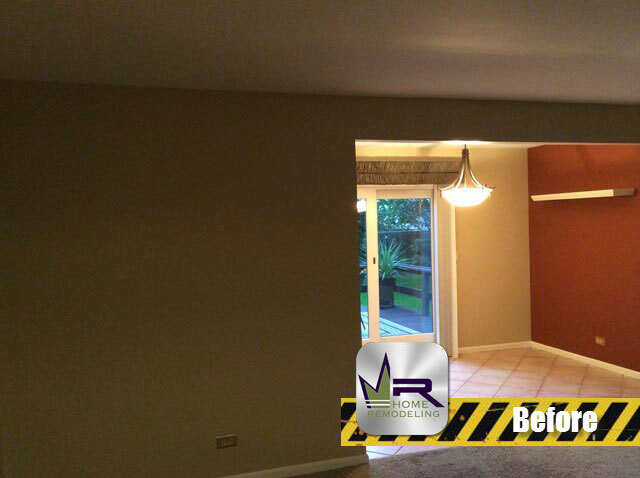 The removal of the partition was made such a huge difference in the layout and floor plan of the entire first floor. 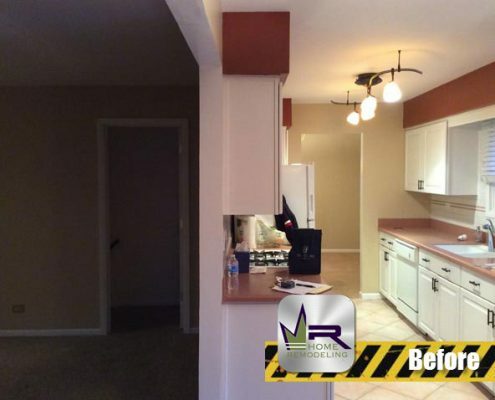 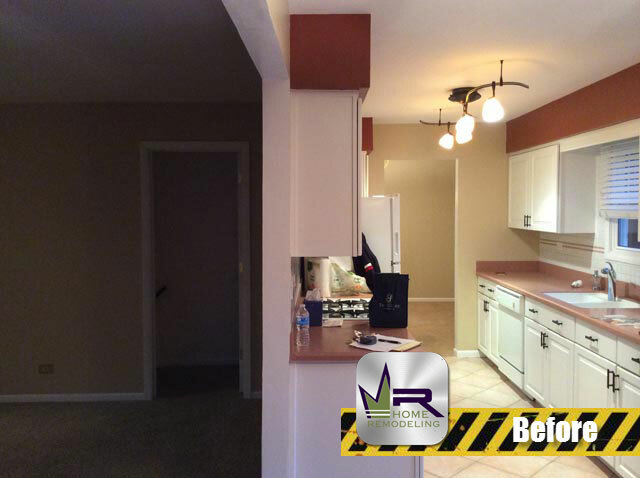 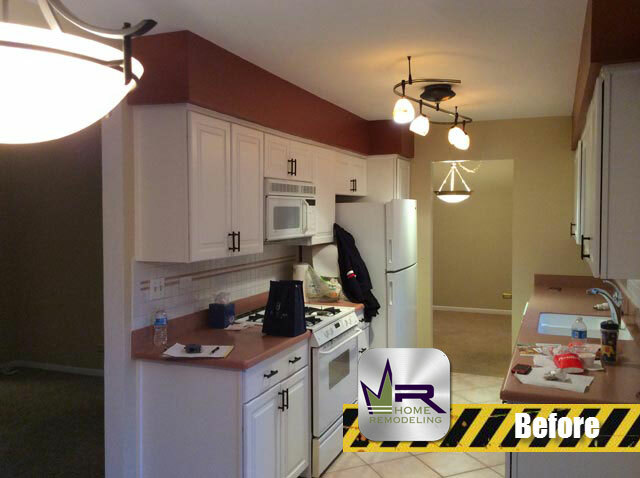 It really served to create a more spacious and open feel in the kitchen area. 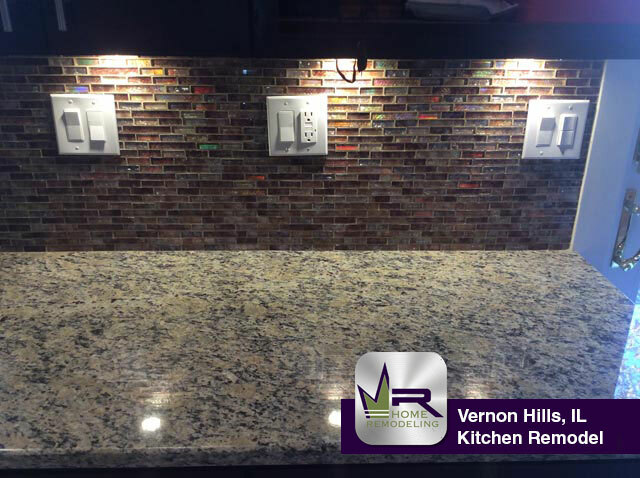 Also, this allowed for a bar height countertop where people can sit to eat or be entertained. 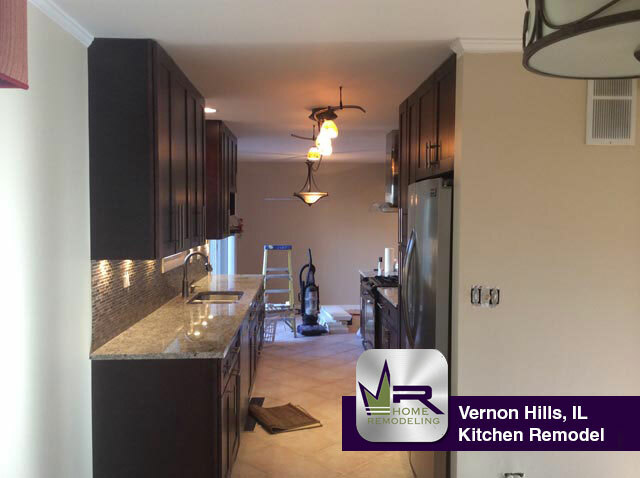 Like the hallway bathroom that Regency had completed, the residents were looking for a darker, more modern color scheme and finishes. Dark cabinetry from KraftMaid along with the Soiree Antique Random backsplash tastefully satisfied that desire. 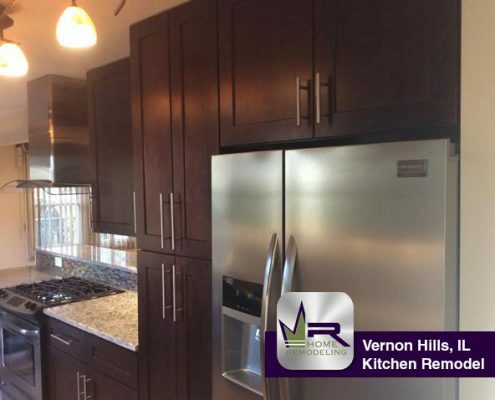 Stainless steel appliances added to the modern appeal of the space such as the: Frigidaire refrigerator and oven/stove top, Broan hood, and Samsun dishwasher. 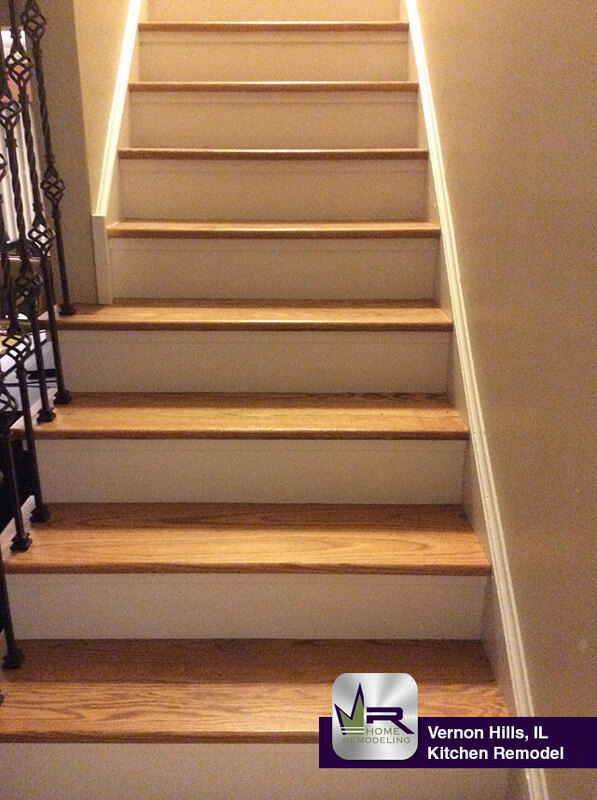 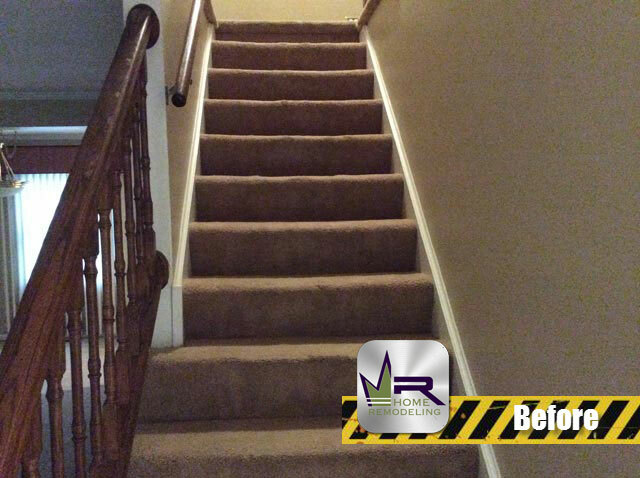 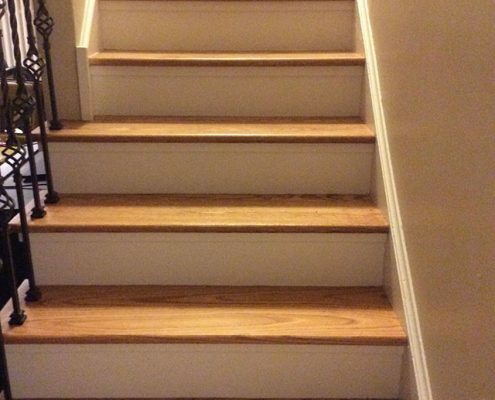 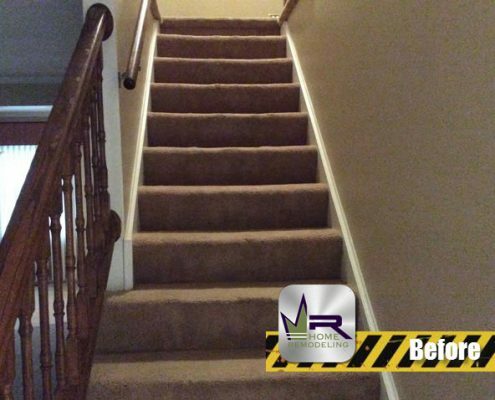 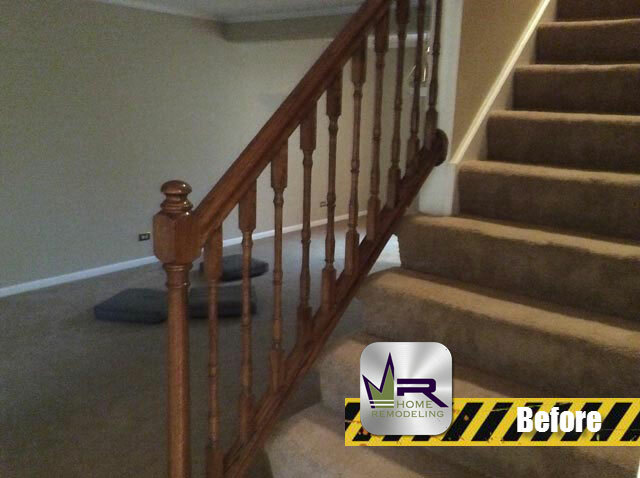 The carpet of the staircase leading upstairs was replaced with a wood finish that makes the area feel much cleaner and more modern. 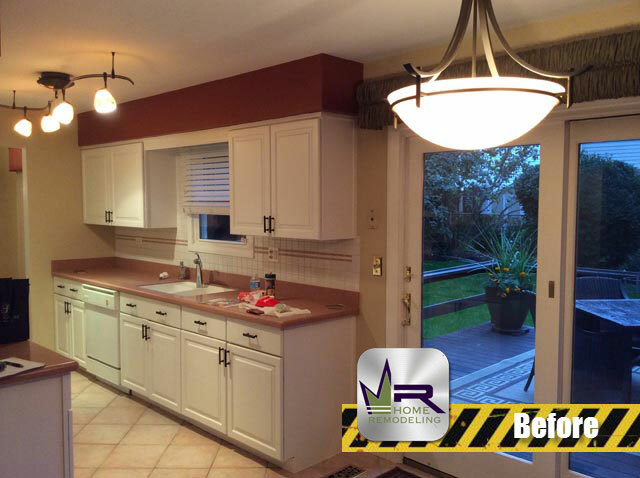 As a whole, the work completed at this property completely changed the whole dynamic of this household. 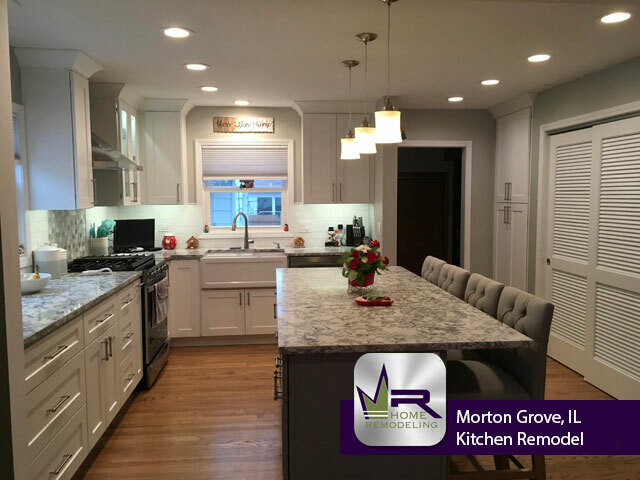 Regency exceeded all expectations in the conversion of several areas in this house to elegant, sleek, and practical layouts and finishes. 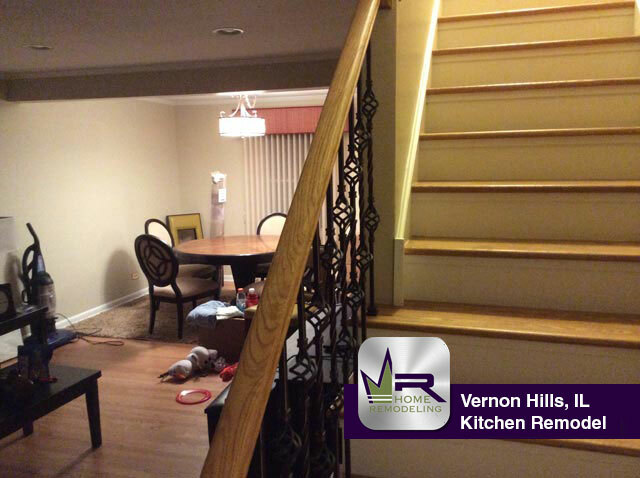 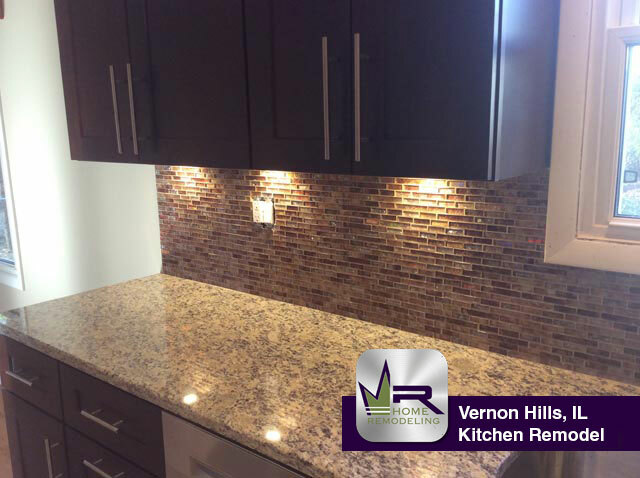 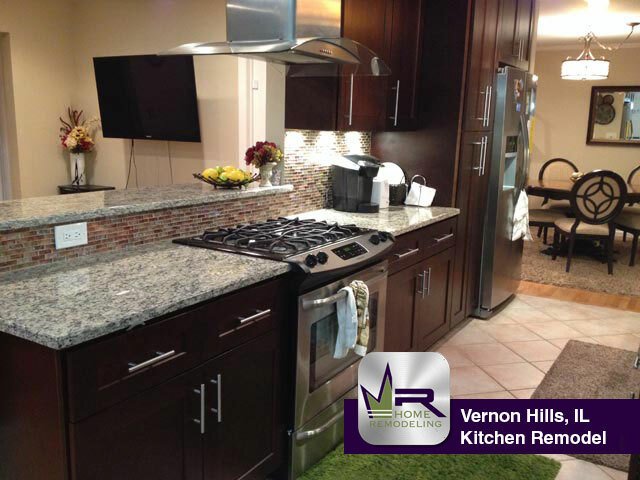 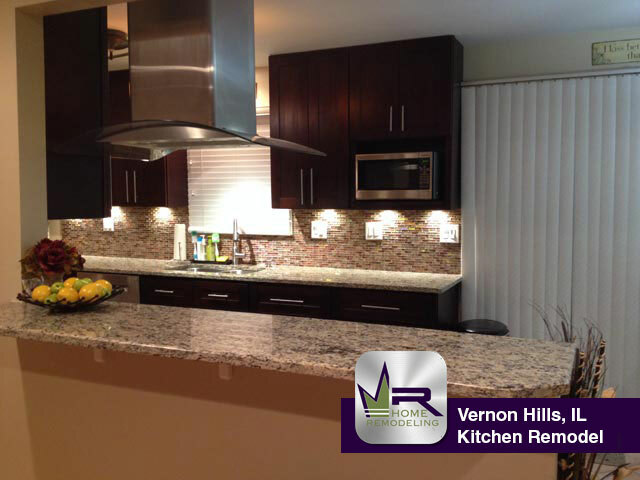 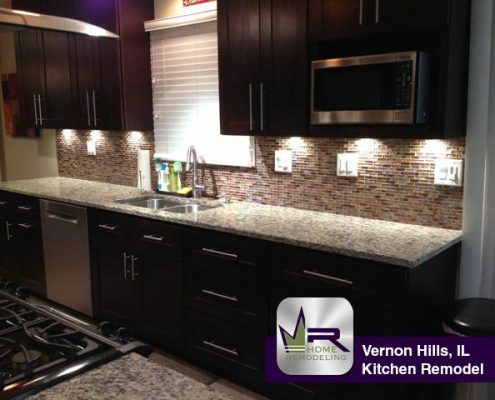 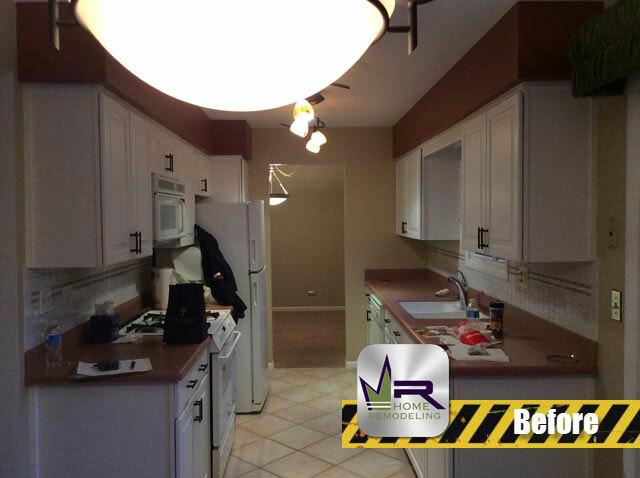 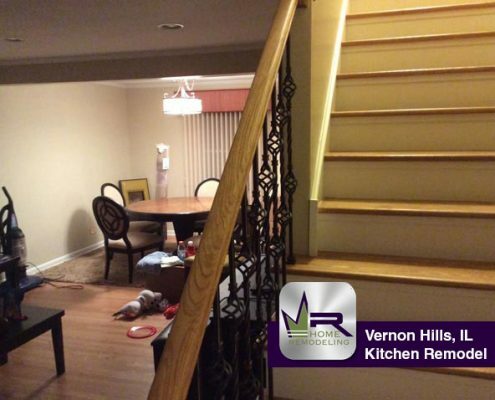 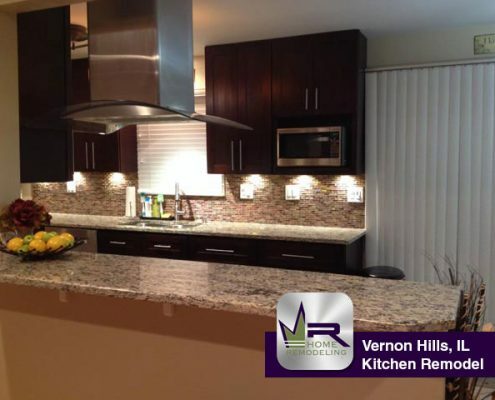 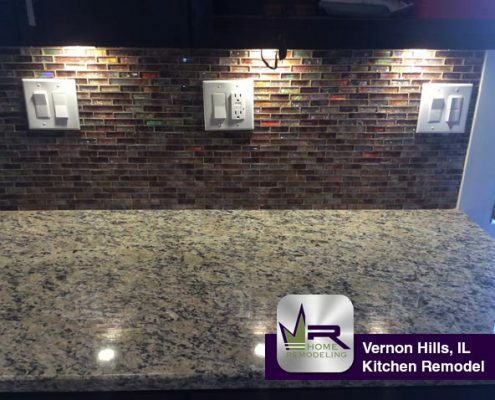 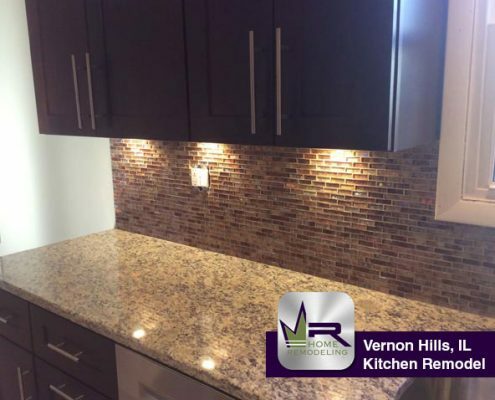 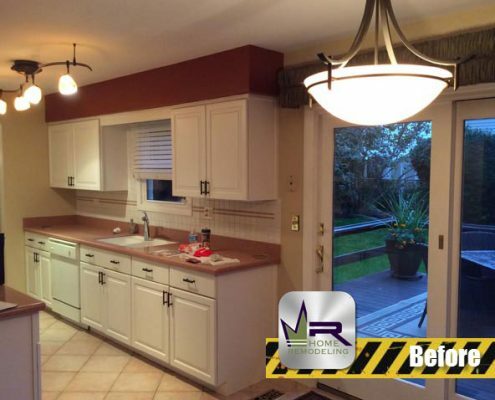 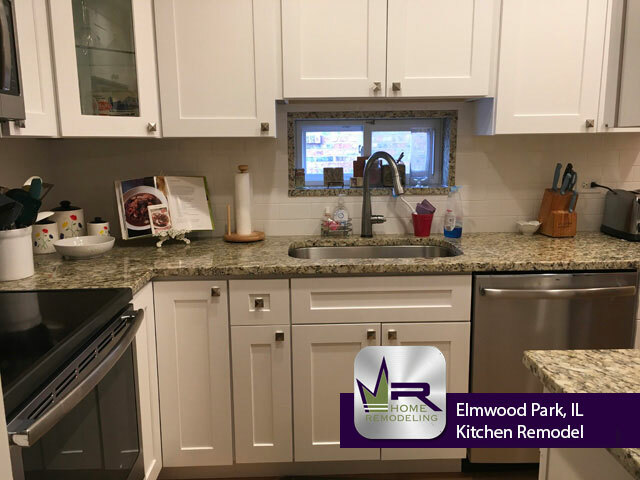 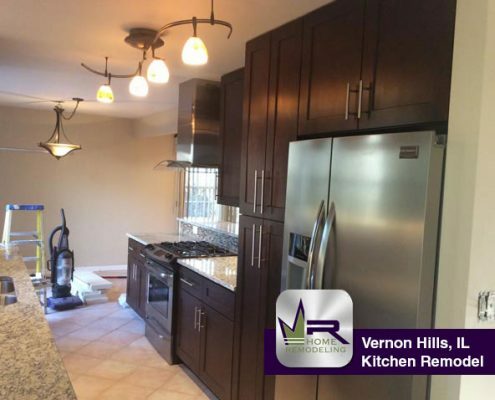 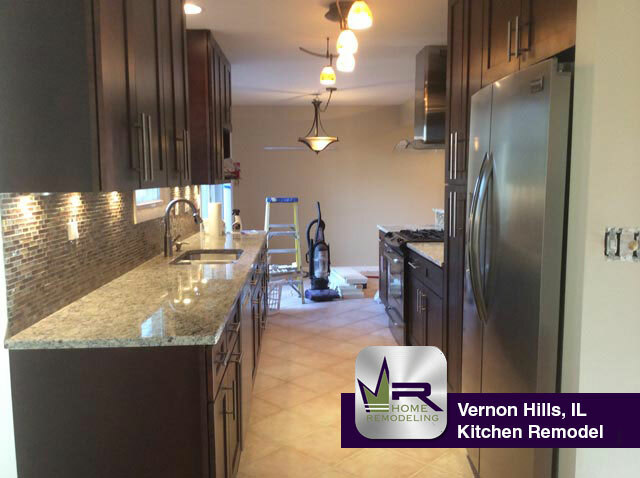 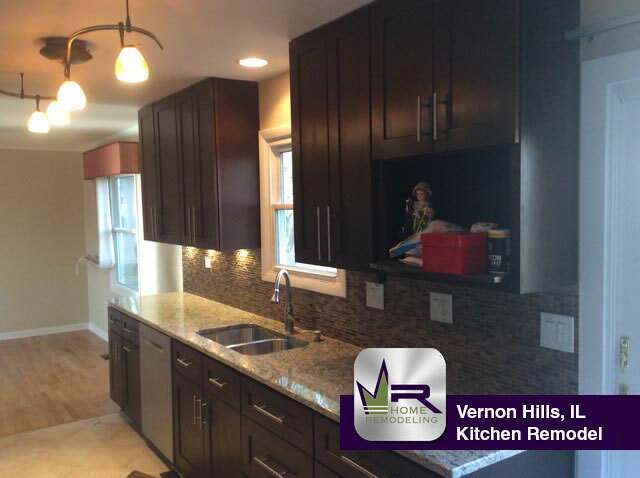 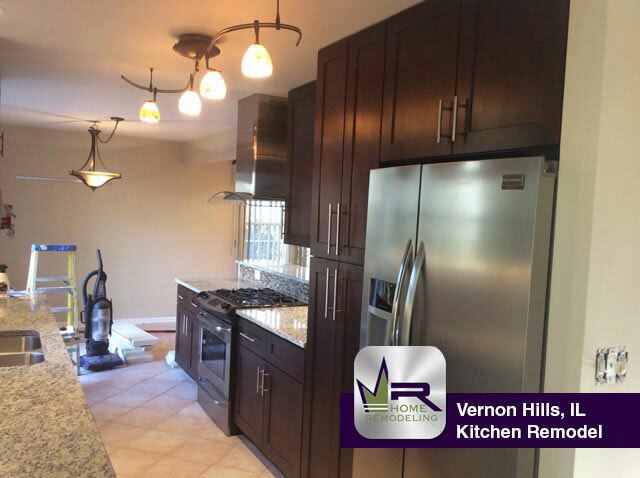 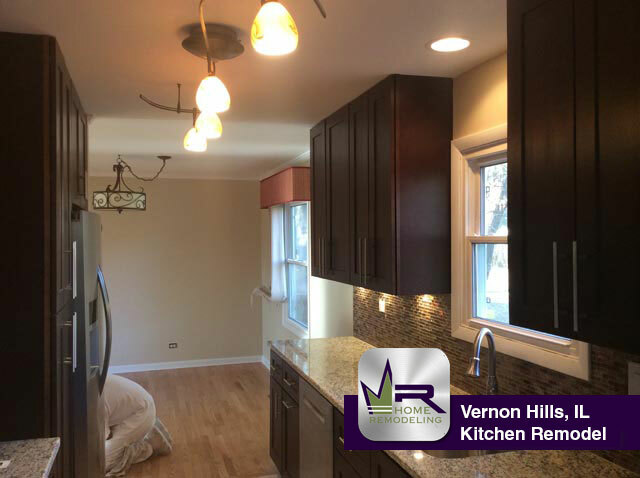 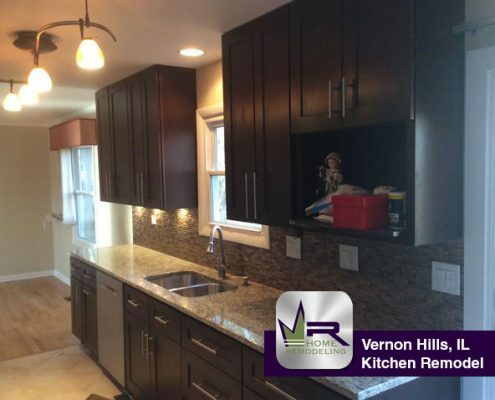 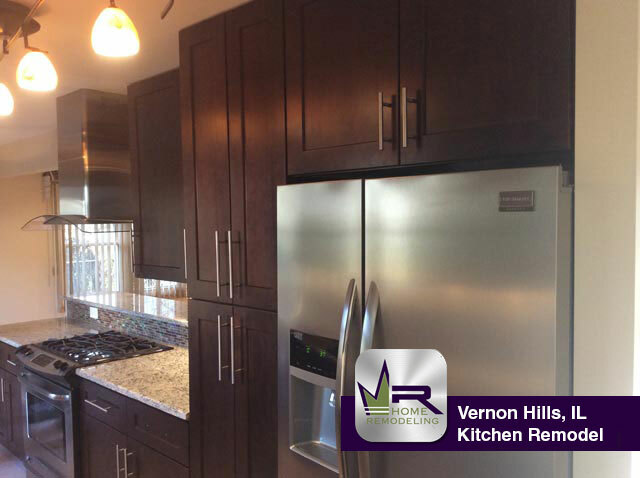 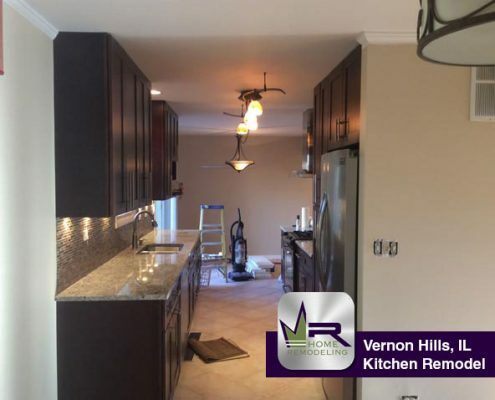 If you want a kitchen remodel in Vernon Hills, IL, call the experts in home improvement, Regency Home Remodeling, at 1 (773) 930-4465.